In front of the Parliament building, there are guards dressed up in fancy costume, guarding the Tomb of the Unknown Soldier. The guards are sort of like the those at Buckingham Palace–standing straight with no expression. At the start of each hour, they have a changing of guards thing going on. The guards march with high kicks. But on every Sunday at 11am, there’s an even more elaborate “show” with band music and many guards marching down the street. Since I’ve not caught any of the changing of guards, I thought I should head down today to catch the most awesome of the show. When I reached the area, I saw that many people were already lined up at the square in front of the Parliament. I went closer and looked between other people’s shoulders to find that the guards were already doing their lining up. I had to look between others’ shoulders for a part view of the procession. Then something caught my eyes. It was the very good looking face of a young policeman. 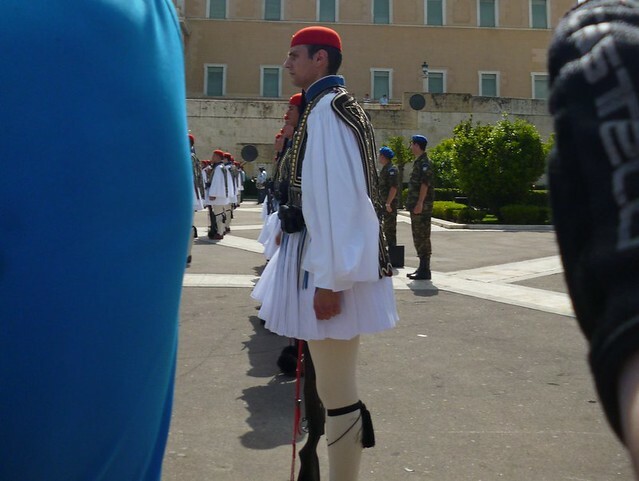 Why are Greek policemen so handsome? I think I now sound very much like a creep. And based on the photo above, you’ve probably removed the bookmark you had for this blog. 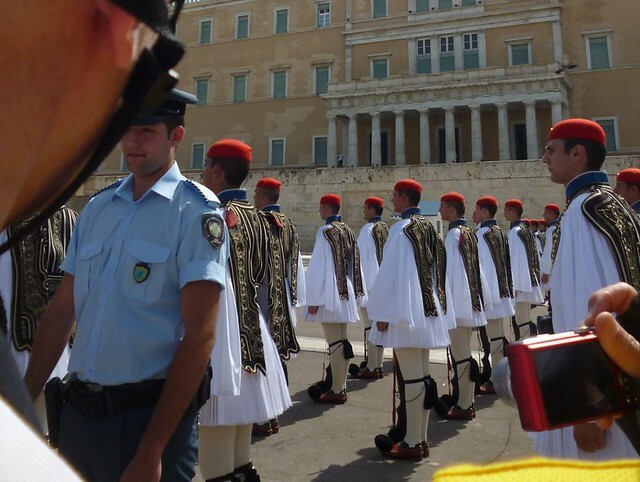 But I have to ask: Why are the young Greek police people so good looking? How is it statistically possible for this place to have so many good looking police people? Do they have a “good looking meter” that recruits have to pass?Someone, tell me! Anyway, after the marching, I didn’t linger around for more stalker shots so that’s the one and only photo of Clark Kent that you’ll see here. The Benaki Museum was just around the corner. Since today was International Museum Day part 2, it was free entry to the 3-storey museum. The collection in the museum was great. Finally I get to see art that wasn’t related to Christianity (those are great too but there is a limit of how much Marys one can handle in a week). Since Museum Weekend was on, there were a lot of events for children as well. I wished I had those when I was a kid but then I might rather stay at home than hang out with a crowd of stranger kids. The Benaki Museum has a nice rooftop restaurant that is shaded by umbrella. I decided to treat myself to some nice lunch since I’ve been keeping within my budget in Greece. Lunch was moussaka–which I dub eggplant lasagna–and a pricey frappe. The creamy moussaka took a lot of effort for me to finish. Next stop, I thought of going to the Byzantine Museum, to see the wonderful…Christian art. (Wait, who was it that said she cannot stomach more Marys?) I like the Byzantine Christian works because the characters are deliberately stiff. So using my trusty Google Maps, I mapped out my route. Hmmm… A 40 minutes journey? OK, I do have a lot of time. I waited for the longest while before bus 132 came. The bus went through a long route before I got off. Following Google Maps’s direction, I arrived at a residential area, in front of a house that did not look like a museum. I got out my phone and checked Foursquare. The app told me that the museum was just next to where I got on the bus, near the Benaki Museum. Other things that happened today: Got back to city center; sat at a nice cafe, reading; went to see the public cemetery of Athens but the gates were not open; saw creepy lady in cream blouse and skirt while walking away from cemetery; got back to hotel; bought club sandwich for dinner; read Jezenbel.